The elegance of a garnet is combined with the beauty and practicality of silver in this vintage-inspired Apples of Gold ring. The silver setting makes for an affordable and entirely beautiful ring, with engraved leaf patterns on either side of the band. The mounting also makes the best use of silver, with a small heart shape allowing for a sweet view of the garnet stone from an extraordinary angle. 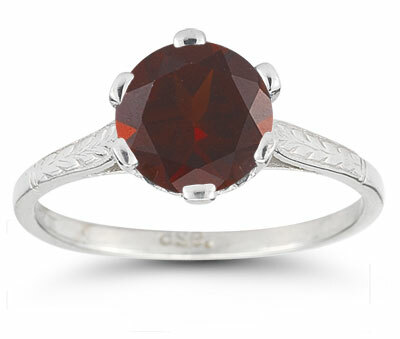 The garnet itself is round cut for exceptional shimmer and is lovely at any angle. We guarantee our Sterling Silver Vintage Floral Garnet Ring to be high quality, authentic jewelry, as described above.